Roasted eggplant Amatriciana with pepperoncini is the hit of Ciano’s $20 lunch. I’m mostly a salad-at-my-desk creature. I actually set the bowl on my lap so I can keep an eye on my email while reading the Times, the actual Times, in print, on paper. I know the economy needs me to go out to lunch. But I figure my friend Bob, the big lunch player, does his share and mine as well. He used to have a hold on the corner stool at the counter of Atelier de Robuchon. Then it abandoned the lunch trade. Lately, he’s been trolling for deals. I do have my own local steal when lured into putting on shoes for an editorial lunch, to woo or be wooed. My neighborhood favorite, the back room at Jean Georges, has crept up from $28 for two courses and $12 for each extra plate, to $38 and $19 per additional choice as fans have multiplied. But I balance that against my romaine economies, knowing I am guaranteed one or two oh-my-God culinary epiphanies, and the light is magical. A week from today, hundreds of restaurants, grand and not, will be dishing up $24.12 lunches, and many have committed to $35 dinners – the official January discount. If the economy seems sluggish, many will extend the deal through February. Others like Nougatine and Gotham Bar & Grill boast lunch deals year-round. “It isn’t a great deal if you have to take a cab,” Bob reminds me. Here’s three standouts minutes from his midtown office perch. Did sending a gift of these luscious scallops throw the kitchen’s timing off? “The subway outside my building goes directly to Ciano,” Bob confides. “At $20.12 for the three course lunch, I can’t afford not to go.” Chef Shea Gallante and his partners decided not to sign up for Restaurant Week rather than raise the price. I love Ciano but I’ve never seen it in daylight. The dining room always smells faintly of wood smoke and bread. We are seated in front of the glass-wrapped hearth, flames leaping, light streaming from the skylight above. A captain slices warm bread and focaccia, bringing it to our table in a napkin, with a ramekin of truffle-scented butter. My crespelle, shimmering crepes filled and rolled with ricotta, spinach, zucchini and Swiss chard, are surprisingly savory, yet as delicate as Bob’s Tuscan bean casserole is hearty and filling, a toss of turnips, smoked fennel sausage and herbed garlic bread crumbs, with only a small trail of excess oil marring the rustic perfection. I’m so excited I forget to shoot photos. I was so busy fainting over the crespelle, I forgot to shoot it. Here’s the fusilli instead. Shea Gallante has mastered his special quarter of opulent Italian cooking – lush pastas with many unlikely ingredients, farm raised meats with roasted winter vegetables and braised pearl onions - but he can be slow. Big surprise. Hot chocolate for dessert. Well, why not? That was long ago. I love that Alfred Portale knows how good he is now. I hope Gallante does too. Of course we are not canceling pastas. That’s why we come here. My secondi – fusilli scantily dressed with ragu of braised veal and smoked pecorino – is good enough, restrained and simple compared to a typical Gallante pasta opera. But the roasted eggplant Amatriciana – layered with a smart tomato-sauced pig jowl and pepperoncini, and crowned with broccoli, is a masterwork. Ciano’s sommelier offers to open any bottle in the house, even if all we want is a glass. You can have half a bottle for half the price of the wine you choose. Bob is sipping iced tea. I’m staying sober for an afternoon appointment. Bosc pear sorbetto with biscotti and Tahitian vanilla panna cotta with blueberry compote are more suitable finales than Valrhona hot chocolate with “malted marshmallow.” I’d prefer that for breakfast myself. $35 pp with tip. 45 East 22nd Street between Broadway and Park Avenue South. 212 982 8422. Click here to read my Bite on Ciano. 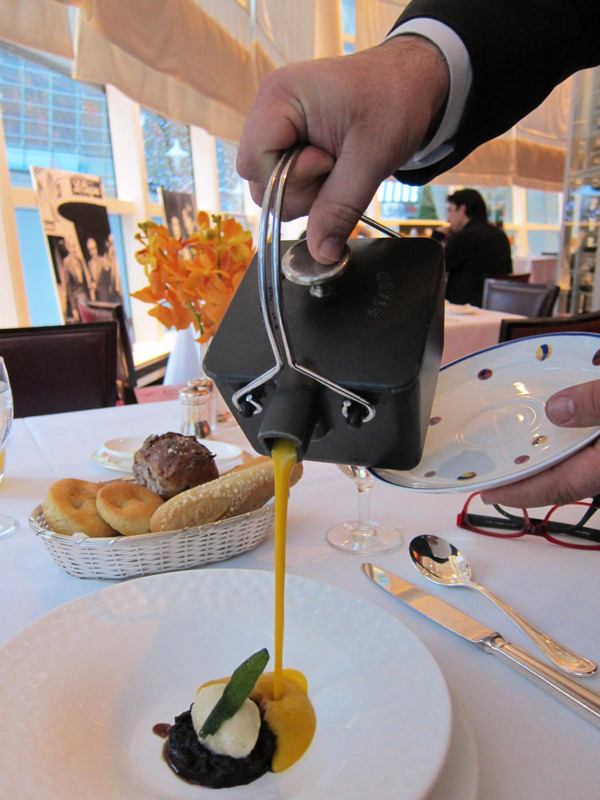 High-price fuss over butternut squash soup at Le Cirque’s $28 Cafe lunch. 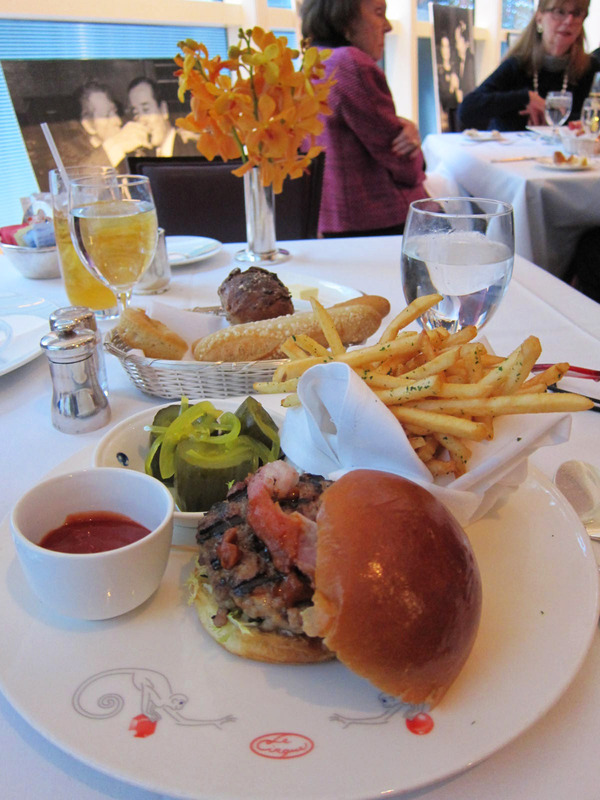 For months the discount lunch zealot has been calling with raves for the $28 two course Cafe Menu in the bar at Le Cirque, beseeching me to join him. I was suddenly feeling a lot like Christmas right after Thanksgiving so I untangled myself from the computer. At 12:15 we had our choice of tables at the shaded windows where big photo blowups of Sirio with celebrities line the window sills - the Maccioni boys as youngsters, Kurt Douglas with that dimple in his chin. How young we were. How beautiful. I’m staring directly at Sirio with Danny Kaye. A pork and bacon sandwich for the gourmand hall of fame. Will Chef Hopson recycle it? There’s no stinting on upscale luxury back of the bar. The rosy glow of upside down umbrellas in the party room has drawn a holiday crowd of discount diners. Each table had a vase of salmon-colored Thai orchids. My companion, newly svelte from a luncheon sabbatical at the Golden Door, has already eaten most of his favorite breads. “Bring more so she can taste everything,” he instructs. “There are nine kinds of bread,” he informs me. He’s a regular. Waiters jump. His tall “Arnold Palmer” (half iced tea, half lemonade) is refilled at least five times with a single $9 charge. Savvy bargain lunchers sit in the pink glow of the umbrella room. Indeed, we have more attention than I need. Marco, the middle son, who doesn’t know what a short conversation is, announces that his two brothers are divorcing, and his first child is due any day. Mauro, the youngest, checks in, filling in for the absent Sirio. The menu has many choices with supplements on only a few items. I’m overwhelmed. Here’s Chef Hopson’s whimsical Caesar with a fried egg on the side. “Not like this Caesar.” The kitchen has a mind of its own ignoring our order. Bob gets a cup of the butternut porridge. I get the complete royal soup service: a captain pouring really hot, exquisitely seasoned purée atop huckleberry chutney and a quite unnecessary pouf of sage- infused whipped cream. For three years, executive chef Craig Hopson has been trying to put his signature on the menu at Le Cirque. His Caesar, a rectangle of slivered romaine with a trio of white anchovies on top and a fried egg on toast alongside, is thrilling. Sage Chantilly is not. Feeling guilty over holiday excess? Order salmon with fennel and verjus. Inevitably there is a middle course we didn’t order, caramelized pate a choux gnocchi with plump Burgundian snails. I imagine I can taste the grass they’ve eaten on their way to the jar. My pal’s abstemious salmon filet with mushrooms in verjus is perfectly sober and proper. Since I haven’t spent a small fortune slimming anywhere and am in a carefree state of denial as always, I order the Mangalitsa pork and bacon burger. This Hungarian-born breed is known for double the marbling of everyday porkers. I could say my eyes fill with tears. I could say my head hits the ceiling. I know I am swooning over the rich-as-Warren Buffett-ness of it. Canyon Ranch or not, Bob will have half. Islands of meringue float in a nostalgic sea of crème anglaise. We agree we don’t really need dessert, $10 extra on the $28 lunch. But spoons and forks are arriving and so is a picture perfect floating island that might have been styled for a new cookbook; alongside, sticky toffee pudding with pecan ice cream and whiskey foam. A compote with mignardises appears. Bob has given up. I cannot. It’s my job, after all. The cost: $49 per person with tip to cover extras. Will you be succumb to toffee pudding with pecan ice cream and whiskey foam? Chef Hopson emerges from the kitchen and sits down across the table. He will be leaving the first of the year, he says, describing his plans for the Brewster, an upscale restaurant in a duplex near Chinatown in a new condo building. “I enjoyed opening Le Cirque in India and on the Holland American line. But whatever I do, it is always Le Cirque.” Now he wants something of his own. “Sirio is always the chef of Le Cirque,” he says ruefully. By mid-February the new executive chef Oliver Reginensi will have his signature on the café menu. One Beacon Court, 151 East 58th Street. 212 644 0202. Our server is a cheerleader for Rouge Tomate’s irresistible whole grain bread. Coconut milk and Greek yogurt mellow the curried carrot soup. Even though I found the food reasonably edible, I had never been drawn back. Now, with the arrival of Peter Esmond from Per Se as director, the menu has evolved, “Discount Daily Bob” assures me, and I must taste the $29 three-course Business Lunch. To get a pure experience untainted by Bob’s contagious enthusiasm, I invite a friend. I’m early. I settle into a blond wooden booth with taffeta wrapped pillows, overlooking the vast front room, almost full, mostly women. Impossible not to feel healthy after hitting the broccoli. But I could live without peanut mousse. My companion Naomi agrees we should have a fruit juice mocktail. She decides to order the Pomegranate Mint because she hates pomegranate. “If they can do a drink I like, that will be an accomplishment.” (And some people think I’m difficult.) I order the alcohol-free Orchard Street because it sounds like that mix of crabapple and apple juices, fresh lemongrass, lemon and ginger syrup could be my kind of drink. Indeed, it’s tangy and tart. As is often the case these days, the bread, served with eggplant spread and herb-infused butter, is too good. Carrots can be tricky in a soup. They require a balance of oomph to avoid a carroty sludge. Here it’s curry, coconut milk and Greek yogurt that do the trick. I smell black truffle oil too, but happily, I can’t taste it. 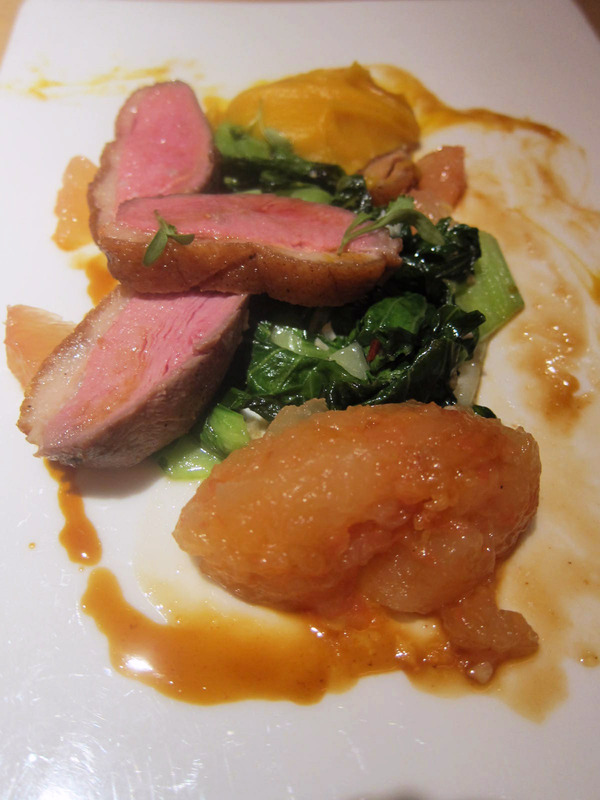 At last, real food: rare and meaty duck a la plancha with baby bok choy. Naomi’s “Greenmarket Broccoli Salad” is a pleasant toss of Satsuma mandarins, sesame seeds and red watercress. The peanuts don’t need to be candied and I would gladly lose the loose plop of peanut mousse. But we’re both pleased with her Alaskan spot prawn agnolotti in kohlrabi with watermelon radish and teensy honshimeji mushrooms, in a ginger-lemongrass consommé. Long Island duck a la plancha tastes like real food, meaty and rare, alongside baby bok choy and grapefruit-apple compote with a sweet-and-sour ginger gastrique dribbled on the plate. Honey-roasted pear with chestnut crumble and buttermilk-lemon ice cream. Followed by chocolate-glazed gingerbread with soy chocolate gelato, and an undisciplined but delicious hodgepodge of honey-roasted pear with chestnut cake crumbs and buttermilk ice cream, I’d say it’s definitely a deal on my penny pincher scale. $48 pp after tip. 10 East 60th Street. 646 237 8977. All photographs without attribution are by Gael Greene and may not be used without express permission.